A few weeks ago I wrote a post about how to hang artwork - as in the practical, physical steps to positioning, measuring, nailing, and hanging frames and canvases (download the free step-by-step guide here). Today, we're taking a step back and discussing the question that precedes how to hang artwork, which is where to hang artwork. You've probably heard the best approach to buying art is to buy what you LOVE - not what is trendy (unless you love it), not what you think will gain value (unless you love it), and not what someone else says you should get (unless you LOVE it). I completely agree with this approach, and I've found that when you find artwork you LOVE, that sparks a deep sense of soul connection (more on that topic coming up), you will find a place in your home for it. So, while there's nothing wrong with keeping an eye out specifically to fill the wall over your sofa, don't let that stop you from exploring the work your soul connects with, that may not be for a specific spot, but could live elsewhere in your home and enrich your daily life for years to come. Whether you have a formal foyer or not, chances are you have a distinct area that signals an entry. In our home, it’s an overcrowded coat hook and a pile of shoes (we're working on it...). 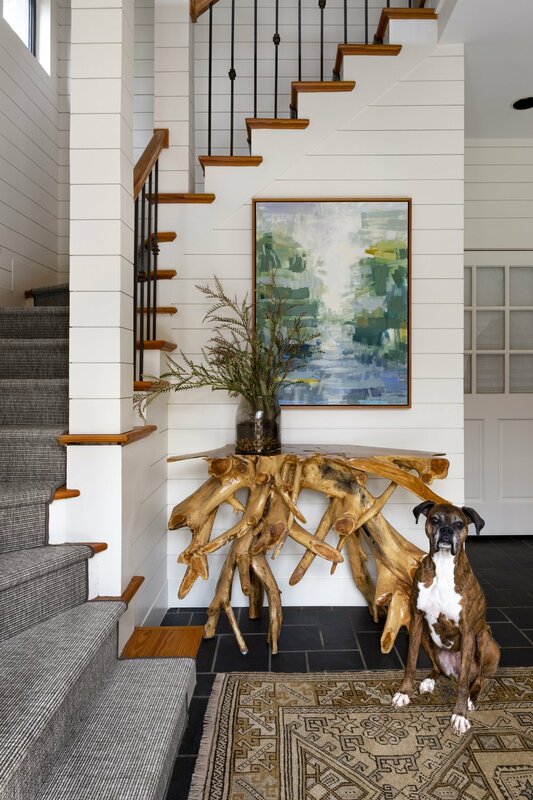 Regardless of what it looks like for you, the entryway to your home is a perfect location to hang a piece of art that sets the tone for your home. I read in Donald Miller's Scary Close, that he and his wife Betsy dedicated a theme of Restoration to their home. I found that a beautiful practice - centering the items and activities in your home around your home's purpose. Artwork at your home's entrance is a perfect way to set the tone. This has gained some popularity over the past few years and with good reason - bookshelves are not only for books. Mostly for books, but not only for books. A bookshelf is the perfect place for small canvas paintings to sit atop a stack of books or act as a bookend. Framed pieces can also be leaned up against the back of the bookshelf to add depth and visual interest. This is also an easy place to start a collection because smaller paintings usually are less of a financial investment. It's not a revolutionary idea to hang artwork over a bed, but it's an idea worth repeating. A bedroom should be welcoming, cozy, and make you feel like you could snuggle up and read forever. In a word, it should be restful. For some people this means calming neutrals to slow down the mind, and for others it means exotic prints and florals to stimulate the imagination - rest looks different for everyone. So find a painting that reflects what rest means to you. Maybe it's a river painting with soft blues and greens, or maybe it's a moody landscape, or a series of botanical illustrations. Whatever it is, make it something you wouldn't mind dreaming of. If you're lucky enough to have a guest room, give it some art. It's such a fun room, because it's not for a specific person so basically you can do whatever you want. This is a great place to hang a gallery wall of several small paintings, or a painting you want to live with for a few weeks before deciding where its permanent home will be. Also if you have a roommate or spouse living with you, this is an easy place to hang the work that you love but he/she isn't so into, because chances are they won't be looking at it everyday, but YOU can visit it whenever you want. And your guests will probably love it, too. Everyone goes to this room multiple times a day, so don't neglect it! I am very pro-bathroom-art (which I'm officially deeming a stance). Go take a look in your powder room and/or bathroom. Look over the tub, next to the sink, above the towel bar - chances are, there is a bit of empty wall space that a framed illustration would work perfectly in. Bathrooms are great for framed paper artwork because condensation can be wiped off glass and won't mess with the canvas fabric over time. You know that little sliver of wall space between doorways, or on either side of the curtains, or to the right of the coat closet? Hang some art on those walls. It will make your house feel more special and larger because suddenly your eye is drawn to the "forgotten" areas and you pay more attention to new sections of the home than you otherwise would. The kitchen is the heart of the home, of course, because that’s where the snacks are. And snacks feed the heart. Right? Anyway, your home's heart deserves to have art on her walls. Hang a giant canvas on the wall behind the dining table, or a few small framed pieces on the wall next above countertops (framed with a glass front so it can be wiped down if it's in a food-prep zone). I started out by saying you should have artwork in your entryway to welcome people (and yourself) into your home. The same goes for when you're leaving. There's something special about planting a reminder by the door you leave through, to take the reminder with you as you go about your day. Let this artwork serve as a statement of what's true, beautiful, joyful, or whatever will fill you up to go face the day - especially if you're an introvert like me and leaving home can sometimes feel strenuous. The entryway art and exit door art are like the bookends to your home. I hope this gives you some ideas, or at least a jumping-off point to think about how to incorporate more meaningful art into your home. Click here to download a full check list of places in your life to incorporate art. As in any creative endeavor, styles shift and change with time. I felt a slight but definite shift in the studio when I was painting these - partially because I was using new tools which of course makes a difference, but also in the way they were approached. These were quick, more gestural, more layered, a bit looser. Now available through the gallery! I've been using a lot of house paint lately. The vast majority of the paints I have been using in the current series are actually just samples from Home Depot. Something about the consistency, unlimited hues, and semi-gloss finish. I'm a fan. Yes, it's times like those I feel less than thrilled with paint, in general, as a concept. Studio Updates & A Show. One important bit of news is that I have found the cutest paintbrush in all the land, and it is mine, all mine. Fire engine red, wide-bristled, and rearing to hit the canvas. Indeed, m'friends, this is surely the dawn of an enduring companionship between painter and paintbrush in which new things of joy are created and shared. And in other news, I shipped out a pile of paintings today for a show in Dallas, TX. If you find yourself in the area Thursday or Friday April 7-8, swing by and spend some time checking out the work.